Google Drive is one of the pioneers in the field of online storage. This is the replacement for Google Docs and allows you to share and backup some of your data on the cloud. Google Drive looks like a folder that you can feed from your computer. You can choose which folders you want to synchronize, which optimizes your use when you have a limited Internet connection. Very easy to use, Google Drive also has a nice interface. 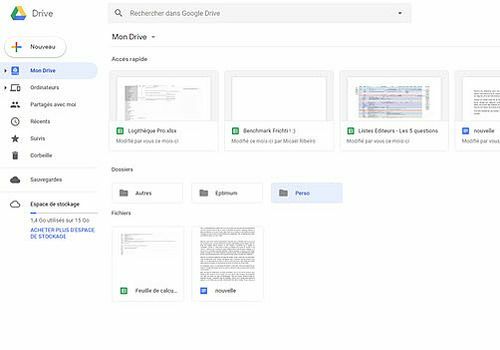 In its web version, you can view most document formats Google Drive adapts to all Google services to provide you with a wide variety of tools. For new subscribers, Google offers 15 GB of storage space to all its users and offers a monthly subscription system if this is not enough.